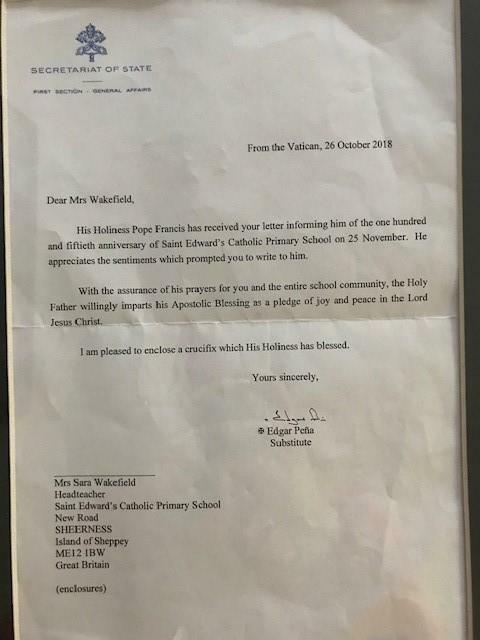 St Edward's Sheerness receives a letter from the Pope! 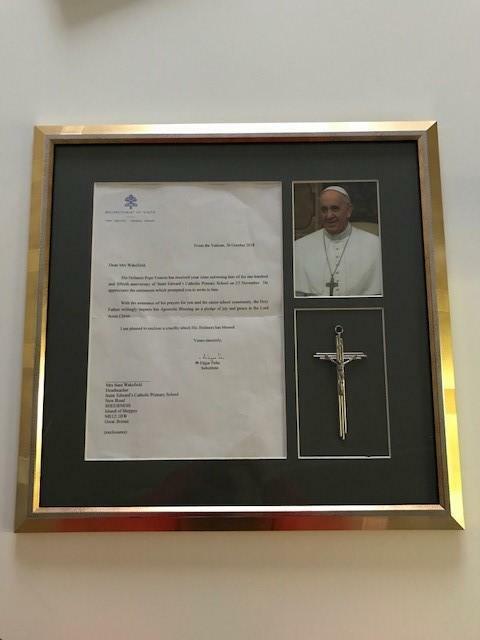 St Edward's Primary, Sheerness were overwhelmed to receive a letter from the Pope's office, together with a photograph and a blessed crucifix. All of which have been beautifully framed and are now displayed in the Academy (pictured below). Sara Wakefield, Headteacher of St Edward's Primary, said "In November 2018 the Isle of Sheppey celebrated 150 years of Catholic education. During the planning stage one of our Year 6 girls wanted to write to the Pope and invite him to our party. This was his response and we were so excited about receiving his letter that we called an assembly and read it out!" On 25th November 2018 the majority of staff and Daniel Coleman from the Diocese attended a celebratory Sunday Mass and party, and Sara goes on to say "Father Frank had photographs of the old school grounds on display and we invited previous Headteachers present too. I met Mr Murphy who was the Headteacher in 1960 and his children. It really was a lovely event and after Mass party. We are now looking forward to the Summer when we will celebrate 90 years of St Edward's. I am sure that party will be fun too!"